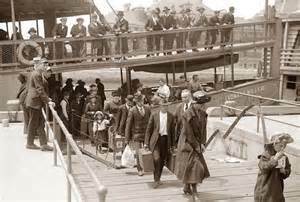 Migrants arriving at Ellis Island off New York City. Most of us are familiar with the “American Dream” of the 19th and early 20th Century, when waves of immigrants left Europe for the US in the hope of creating a better life for themselves. I’ve been to Ellis Island and seen the scale and hope of those people. Years later further waves of migration followed when those fleeing war in Europe made the trip across the Atlantic to find safety and a future for their families.